Sime Darby Property Bhd, the property arm of Sime Darby Bhd, is expected to sign a partnership agreement with General Electric Co within the next two to three weeks to deploy its sustainable products and technology for the Idea House project in Shah Alam, Selangor. 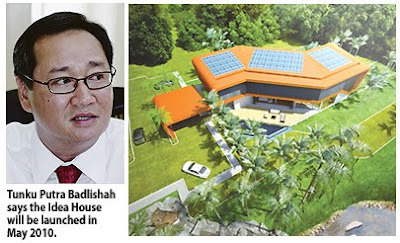 The property developer is setting up the multi-million ringgit two-storey Idea House at its Denai Alam township. The Idea House, believed to be the first of its kind in the country, is a prototype dwelling where Sime Darby Property will systematically adopt the strategies used in the construction of the house for its future projects, demonstrating its commitment to create sustainable futures. Conceived as a test bed for new ideas, the house showcases the latest in sustainable architecture in the buildings' quest to become the first carbon neutral residence in Southeast Asia. It is understood that Sime Darby Property will also sign a similar agreement with Cisco Systems, Inc.
Sime Darby Property managing director Datuk Tunku Putra Badlishah told Business Times that the company is in talks with several parties, but did not name them. He said the Idea House will be ready and launched in May 2010. He added that one of the most significant achievements for Sime Darby Property in the past three years was the development of the house. The house will showcase the latest in construction solution and system applications, which will be an example of how green architecture, good design and sustainable living can work harmoniously. It will be a self-sustaining building that generates power from the sun and reuse harvested rain water, built entirely on the principle of modular construction where the user would be able to expand and contract the building as the need arises. KUALA LANGAT: LBS Bina Group Bhd is set to launch more new projects this year, prompted by the pickup signs from the property market and better gross domestic product (GDP) growth prediction by the Government, said managing director Datuk Lim Hock San. “In view of such good sentiments, we plan to launch more new projects at Bandar Saujana Putra, Puchong, Batu Pahat and Cameron Highlands. “We will, however, focus mostly on integrated township Bandar Saujana Putra,” he told reporters yesterday after the launch of the 88-unit first phase of Ivory Residences at Bandar Saujana Putra here. The group would continue to build more affordable houses without compromising the quality of the products, Lim said. “This is what we are doing at Bandar Saujana Putra, offering buyers affordable homes such as link-houses or semi-detached units,” he said. Ivory Residences comprises 376 semi-detached cluster link units with built-up of 1,722 sq ft and priced from RM339,900 to RM426,100. Bumiputra purchasers are offered a 7% discount. Lim said Ivory Residences would be developed in three phases with the first phase scheduled for completion in two years or earlier. He also said the group had extended its special housing package called “LBS Hassle Free Home Ownership” to the purchasers. The scheme allows the buyers to pay a 10% deposit upon signing of the sales and purchase agreement and the balance of 90% would be financed by financial institutions for qualified purchasers where the loan interest incurred during construction would be borne by the developer. Furthermore, Lim said purchasers of Ivory Residences would be given 5% rebate. Spanning over 835 acres, Bandar Saujana Putra is located along the Elite highway and in the hub of the Southern Corridor of Selangor. To date, more than 4,800 residential and commercial properties with a total gross development value of RM500mil have been completed and delivered to purchasers. PETALING JAYA: Gamuda Bhd’s wholly-owned unit, Gamuda Land (HCMC) Sdn Bhd, has entered into a joint venture with its Vietnamese partner, Sai Gon Thuong Tin Real Estate Joint Stock Co (Sacomreal) to undertake a RM6bil project in Tan Phu District, about 9km from the central business district of Ho Chi Minh City. The company yesterday signed a shares-sale agreement with Sacomreal for the proposed acquisition of a 60% equity interest in Saigon Thuong Tin Tan Thang Investment Real Estate Joint Stock Co (Tan Thang Co) for a cash consideration of US$82.8mil. Tan Thang has the rights for the investment and construction of a parcel of 825,216.5 sq m land into a residential, sports and educational complex with an estimated gross development value of RM6bil. The project will comprise 7,000 units of medium-end and premium apartments with built-up from 700 to 1,500 sq ft, and 37,000 sq m of commercial space. The apartments will initially be priced from US$900 to US$1,100 per sq m while the commercial space will have an average price of US$2,650 per sq m.
According to Gamuda Land managing director Chow Chee Wah, some 80% of the project would comprise residences that would be undertaken in seven parcels. “The 82ha for the project is one of the last sizeable land parcels available in Ho Chi Minh City. Our goal is to meet the needs of Vietnamese who want good value-for-money products and prefer innovative lifestyle projects,” he told StarBiz. The master plan for the development has been approved and the project is expected to commence in the third quarter of this year and will take seven to eight years. 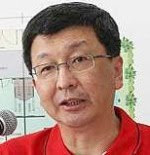 Chow said besides a good concept, facilities and layout, the project’s unique selling proposition would be a 20ha integrated park. “We are confident the project will do well as it caters to the growing demand for quality residences in line with the rapid urbanisation and rising per capita income among the Vietnamese. “Our target markets include young executives, professionals and mid-level management executives,” he added. Close to 65% of Vietnam’s 87 million population are aged 35 years and below. Ho Chi Minh City has a population of more than nine million and 60,000 expatriates. There are also the Viet Kieus - Vietnamese who are residing abroad - who are also buying property for their own use and for investment. Chow said the dong’s devaluation had contributed to more Vietnamese resorting to property investment as a reliable savings instrument instead of saving their money in the bank. With the upcoming closure of all gold trading floors in Vietnam at the end of this month, there will also be a re-channelling of capital flows into the property market. Sacomreal was previously involved in providing real estate services but has since expanded to developing and marketing of high-quality apartments. PETALING JAYA: The arbitration claim by Bahrain Asphalt Establishment BSC (BAE) amounting to 109.27 milion Qatari riyal (RM101.06mil) against the Gamuda Bhd-WCT Bhd joint venture (JV) in Qatar may have an impact on both the Malaysian companies’ earnings, according to analysts. It said the arbitration could be long drawn, based on WCT’s ongoing arbitration with Dubai’s Meydan LLC, where the latter had cancelled a deal to build a race cource there. The claim has been pending since early last year. “Assuming the (BAE) claims are made in the current financial year, our FY10 earnings (for WCT) forecast would be reduced by 29%,” said OSK. The research house forecasts WCT to record a net profit of RM171mil on revenue of RM2.6bil for the financial year ending Dec 31 (FY10). It forecasts Gamuda’s earnings would be reduced by 17.6% in the financial year ending July 31 (FY10). The research house forecasts a net profit of RM292.6mil on revenue of RM2.96bil for the company. To recap, Gamuda and WCT said in separate statements on Tuesday that the claim was over disputes in their sub-contract for the granular sub-base and flexible pavement works in the construction of the 43km new Dukhan Highway from Shahaniya to Zekreet in Qatar. Gamuda’s and WCT’s interests in the JV are in the proportions of 51% and 49% respectively. BAE is claiming from the Gamuda-WCT JV the total quantified sum of RM101.06mil comprising 94.87 milion riyal for alleged prolongation, escalation, collateral and associated costs for 728 days’ delay in completion of the sub-contract works; 13.43 million riyal for alleged overcharge/wrongful deductions; and 964,969 riyal for alleged wrongful deduction for supply of bitumen. It is also claiming further unquantified sums for legal costs, arbitration costs, and interest. Pursuant to the announcement, Gamuda’s shares fell two sen to RM2.79, while WCT lost nine sen to RM2.72 the same day. Gamuda’s shares were unchanged while WCT fell four sen to RM2.68 yesterday. “The fact that WCT’s shares have fallen is indicative that shareholders fear that there may be an impact,” said an analyst from a local bank-backed brokerage. In their respective statements on Tuesday, Gamuda and WCT said they were of the opinion that the request for arbitration was pre-mature as the preconditions stipulated in the arbitration clause had not been met. PETALING JAYA: Property developer BCB Bhd has acquired a five-acre plot of freehold vacant land in the mukim of Batu in Kuala Lumpur for RM51mil from co-owners Warta Development Sdn Bhd and Yap Khay Cheong & Sons Realty Sdn Bhd. The company said in a filing with Bursa Malaysia that it had entered into the sale and purchase agreement with the owners yesterday.